Everyone knows they should be drinking more water to stay healthy and hydrated, but actually remembering to do so can be a challenge. In fact, 43% of Americans drink four cups or fewer per day, according a 2012 study from the Center for Disease Control. That’s where The Hug, now on Kickstarter, comes in. The Hug solution includes a sensor band that wraps around just about any water bottle to track your H2O consumption, and an accompanying mobile app that reminds you to drink when your hydration levels are low. Dehydration decreases both mental and physical performance, The Hug’s creators point out, but many of us simply get wrapped up in our work and lives, then realize much later how little we drank throughout the day and how thirsty we’ve become. So The Hug becomes a personal hydration coach of sorts, reminding you to drink through push notifications to your phone, while also tracking and scoring your consumption. It also tracks your exercise through connections to other apps like FitBit and RunKeeper, then adjusts its alerts accordingly. The Finnish company behind The Hug recently went through the Techlaunch accelerator here in the U.S., but over the past nine months the team’s four co-founders have been doing product development in Helsinki, says co-founder and CEO Panu Keski-Pukkila, because doing R&D is “significant cheaper” there, as is the cost of living. But, he adds, if the newly launched Kickstarter campaign to fund The Hug is successful, part of the team will relocate back to the U.S. because that’s the primary market for this device. Panu, a fitness fanatic himself, came up with the idea for The Hug after too often feeling tired and run-down. His girlfriend said it was probably because he wasn’t drinking enough water, and as it turned out, that was the case. After dropping his coffee habit for water, and increasing his hydration, he found himself more energized – even without the caffeine. Others, he soon realized, suffered from a range of problems associated with dehydration, too, including dry skin, tension, bad moods, and even kidney stones. So he, along with fellow co-founders Heikki Säteri (CTO), Tapani Honkavaara (COO), and Olli Tiihonen, began working on The Hug. For over a year, the team has been building functional prototypes but they’ve now landed on the final design they’re ready to take to manufacturing. 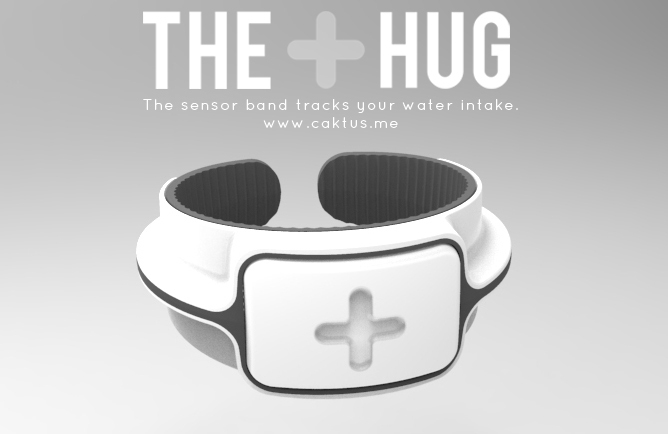 The Hug itself consists of two casings: a silicone band and plastic spring. The electronics housing, also in a plastic piece, is designed to be easily detached with you need to recharge The Hug – which is done through a micro USB charging cable. Currently, the band will ship in Charcoal or White and will come with an iOS application, which has also undergone a redesign. Early backers on the Kickstarter campaign can buy The Hug for $59 and up, which will be much less than the gadget’s final retail price. We should point out that The Hug is not the first device to try and tackle this problem – the Jomi smart water bottle sleeve’s crowdfunding project was suspended for lack of financing, which could imply a lack of consumer interest. (Time will tell for Hug). I have to admit, it’s hard to think about purchasing The Hug without a twinge of #firstworldproblems guilt. Here we are with abundant, safe drinking water and can’t be bothered to drink it. Meanwhile, 783 million people in the world don’t even have access to clean drinking water, and it would probably boggle their minds to think we’re so well off we actually need a gadget and app to remind us to drink. That being said, The Hug can encourage a change in behavior for those with bad habits that, eventually, could become a healthy routine which no longer requires the technological nudging. But please consider donating to Water.org after you fund The Hug’s Kickstarter, OK?